Sorry I'm a little tardy with this post, I'm a workin' man again, you know! 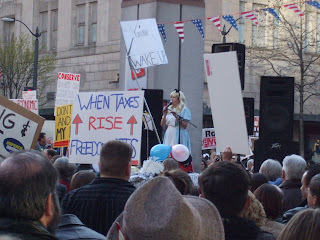 I estimated the crowd at the Seattle Tea Party at about 1,600. A lot more than the 2/16/09 protest, where I estimated the crowd at 150 or so! 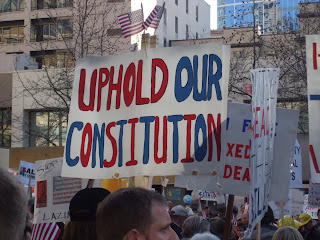 Didn't we hire our representatives to thoughtfully make laws?? 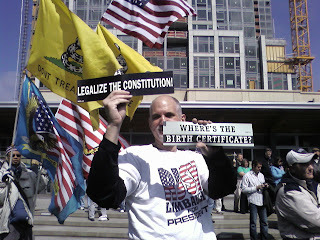 I attended 2 TEA ("Taxed Enough Already") parties on April 15, 2009. 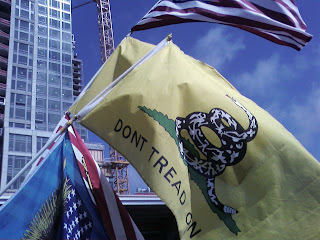 I'll post about the evening Seattle TEA party in a day or two. There were 2 TEA parties in Bellevue, WA, one at Noon, and the other at 5:00 PM or so. 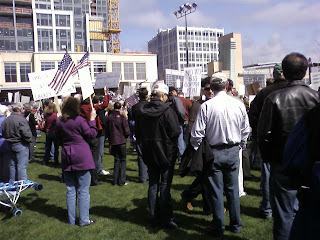 I attended the noon protest, since my new contract is near downtown Bellevue. I estimated the crowd at 1,000 to 1,300. A buddy I met at the scene estimated the crowd at 600. 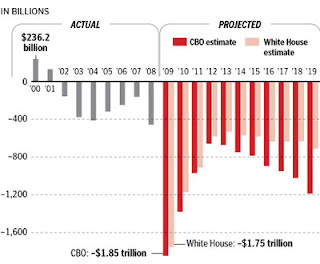 I'm not an expert, but I am an engineer who loves numbers and statistics, I'm fairly confident with my estimate. 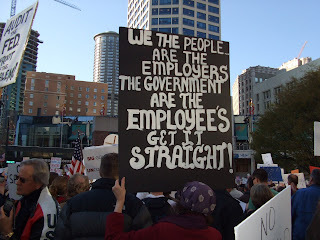 "Under sunny skies in Bellevue, more than 200 people gathered in a grassy park adjacent to city hall over the lunch hour, protesting government spending and taxes." They were either intentionally misleading or very lazy in their estimate. Shame on them. 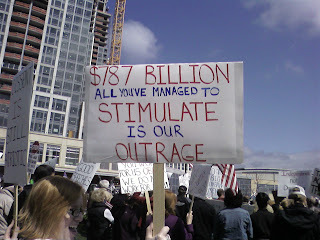 Here's a few pics from the protest. 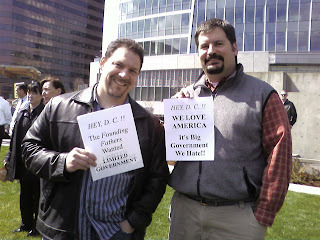 Two like-minded buddies with placards I provided. "WE LOVE AMERICA It's Big Government We Hate!!" First of all, I hope everyone had a great Easter, I certainly did! I arrived early to my church, Union Church, which meets at the Lake Union Armory building, to help a little setting up. We chit chatted, prayed, enjoyed coffee, pastries and fruit for a light breakfast, then the service started and we had wonderful worship music, a reading and a nice message (as usual!). My family didn't have our usual über-family party (the folks and a Stepbrother are in New Orleans, doing the Lord's work helping fix houses damaged by Katrina. Yeah, still! ), but I was invited to a great dinner with my Brother-in-Law's family at a home with a nice view of Lake Washington. really concerns me (and I don't have kids!). 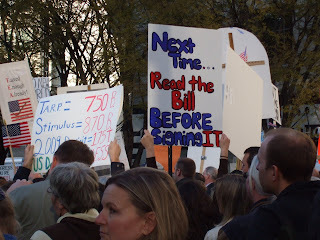 For the first time ever, I attended a deficit/tax protest in February. 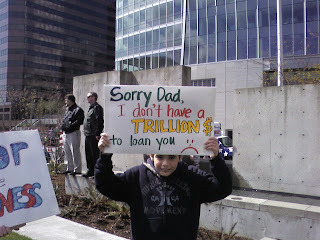 Well, there is a bigger protest being planned on Wednesday, April 15, 2009, and I urge you to attend! A List of Washington State events can be found HERE. I'd like to think this issue is bigger than any one party. Almost all the folks representing us in Congress are to blame. 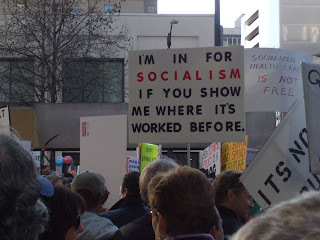 However, it's no secret that the folks that attend these deficit/tax protests tend to lean right... but, I'm willing to bet there are some concerned Democrats/left of center folks who are concerned, too. Happy, civilized and safe protesting! Episode II is now available! My buddy Andy and I have decided to start pod casting! Our web site is called Rain City Bunker, and we started the Rain City Bunker Blog for people to comment on the pod casts. No comments so far... : ( But, we are optimistic we will find a few people (even if just family & friends) who will listen and be entertained. Andy has a nice Mac with the recording software and equipment, I created the website, and we both "host" the podcast. Each show will be about an hour long. So far, we just have one episode up. In Episode I, Andy and I introduce ourselves and the show, talk about our approach to the unusual topics we will cover (along with usual topics), unusual events each of us have experienced, talk about a UFO story, and a couple other topics. We recorded Episode II on 4/5/09, but Andy is working to fix a little technical difficulty before we post it. In Episode II, we interview my Uncle, Eric Miller, about his book & website, Passion for Murder. As readers (I know there's at least 2 or 3 of you!) know, I am working with my Uncle to promote his book. Actually, the desire to promote the book led to the podcast idea. I told Andy that I was trying to get my Uncle interviewed on the national radio show, Coast to Coast AM. Andy said, "Why don't we interview him ourselves?" and the idea was born. We were clueless about what to call the show, Andy wanted something about soggy Seattle, moss or the like. When we were setting up in my basement, I said I wanted the name to be something about a basement. Andy then said, "How about 'Rain City Bunker'?" and I loved it and we instantly adopted the name. Drop by and take a listen!